Beauty-Apartment for up to 4 people,. Only a minute walking from town centre. 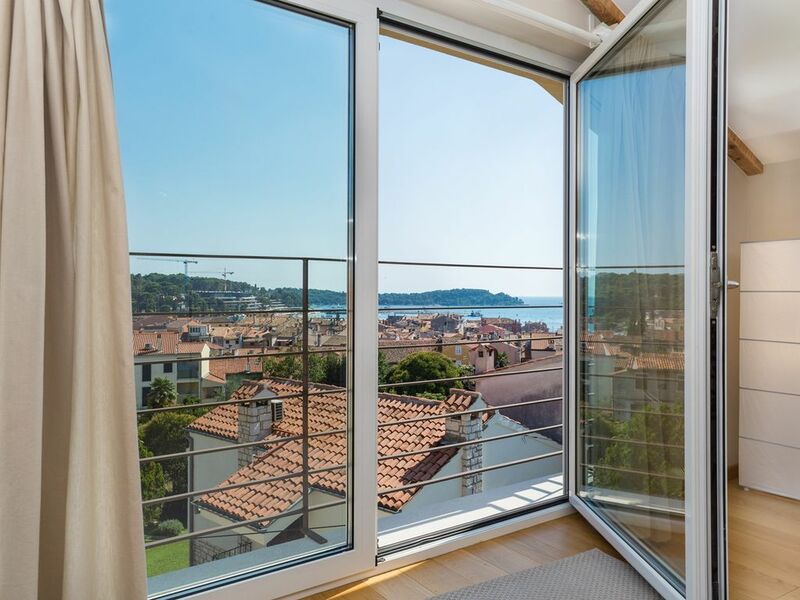 Home Fontera is an beautiful apartment located in town of Rovinj on the west coast of Istria Croatia. With good location, apartment has even better view on city and Adriatic sea. This 70m2 wide apartment consists of a living room with convertible sofa for 2 people, CAB/SAT TV and air-conditioning while having opportunity of a sea and city view. Futhermore, apartment has a bathroom wiht shower and hair dryer, a bedroom with a double bed and kitchen equipped with stove, dishwasher, refrigerator, freezer, toaster and water kettle.There is free Wi-Fi access as well as possibility to bring a pet.Since apartment is in center of the town, all town events and facilities are max. 10-15 min away by walk as well as beaches and some water activities.Closest parking is 100m and is charged. Die Unterkunft liegt nur wenige Minuten vom Hafen entfernt, trotzdem ist es in der Gasse angenehm ruhig. Der Zutritt erfolgt per Code-Schloss, man muss also keinen Schlüssel mit sich tragen. Der Wohnraum teilt sich auf drei Etagen auf. Unten ist die Küche, die alles bietet was man braucht, auch der Essplatz ist großzügig. Im ersten Stock befindet sich das Schlafzimmer mit Doppelbett und das Badezimmer mit Fußbodenheizung (war im Winter dort) und Regendusche, alles neu, modern und sauber. Das Wohnzimmer im Obergeschoß bietet eine bequeme Couch und einen tollen Ausblick auf die Altstadt und das Meer. Klima und WLAN gibt es im ganzen Haus. Der Vermieter ist sehr freundlich und wir haben den Aufenthalt in dieser Unterkunft sehr genossen! Rovinj is a charming town in Croatia. It is located on the western coast of the Istrian peninsula and its archipelago consists of islands, islets and cliffs. Originally Rovinj also was an island but in 1763, the channel between mainland and island was filled. Rovinj has such a rich history that you can not say for sure when it developed. Different styles of architecture show us the masterpieces of builder from the period of Gothic, Renaissance and Baroque. The historic events from Gaelic, Celtic, Slavic, Roman and German made their mark in the culture of Rovinj. Fairy – this is the word which is more suited to the old town of Rovinj. It has a lot of narrow, cobbled streets and fascinating building, so the best variant to see all interesting places is on foot. It is famous for the Cathedral of St Euphimia, the highest church tower in Istria; the Balbi Arch, it is the original historic entrance in the city; the market of Valdibora, where you can find fresh juicy fruits, home-made olive oil, truffles and souvenirs; the artists' street Grisia; the Town Museum, which is home to many archeological findings; Rovinj Aquarium, which is one of the oldest in Europe. And if you go by bicycle, you can enjoy Rovinj's beautiful nature. There are a lot of bicycle paths through pine forests that follow the coastline.